Growing up, Colin and his sisters created what became their family’s favorite special occasion decadent treat, aptly named “chocolate death cake”. The creation was a combination of a boxed chocolate cake mix with chocolate pudding mix and extra chocolate chips all mixed together and baked up with raspberry jam spread between the two finished cake layers, topped with (canned) chocolate frosting, not bad actually for kids growing up way back in the 80’s! If you ask me, chocolate and raspberries are such a perfect combination, even with a highly processed cake mix it’s still pretty damn good, although it is hard for me to get past the canned frosting. So, a few years after we married, I started tinkering with the recipe, one to make it a bit more “homemade” and two to “gourmet it up”. Over the years, I’ve made many different versions of “chocolate death cake” to celebrate Colin’s birthday, originally sticking a bit more to the traditional idea and then veering off into the flourless cake realm. 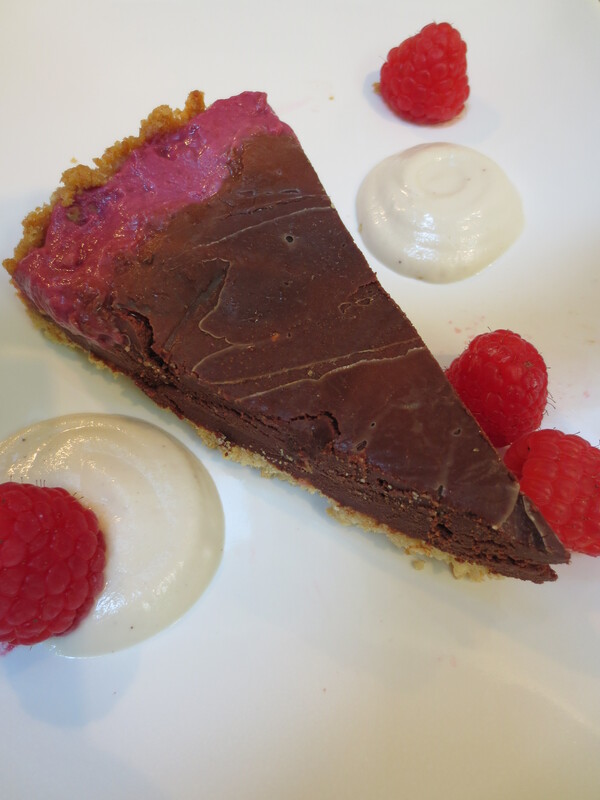 For this year’s version, I created a decadently delicious chocolate ganache tart with a raspberry cream layer and believe it or not, it’s gluten free, dairy free and vegan! But, please don’t let that scare you off, even the most diehard chocolate fan won’t notice the difference. Last Thanksgiving, my sister-in-law Megan requested that I contribute something chocolaty and decadent for dessert, for which I made a slightly adapted version of vegan chocolate truffles from Giada’s latest cookbook “Giada’s Feel Good Food”. Homemade cashew cream replaced the traditional heavy cream in the truffles and they were a huge hit! 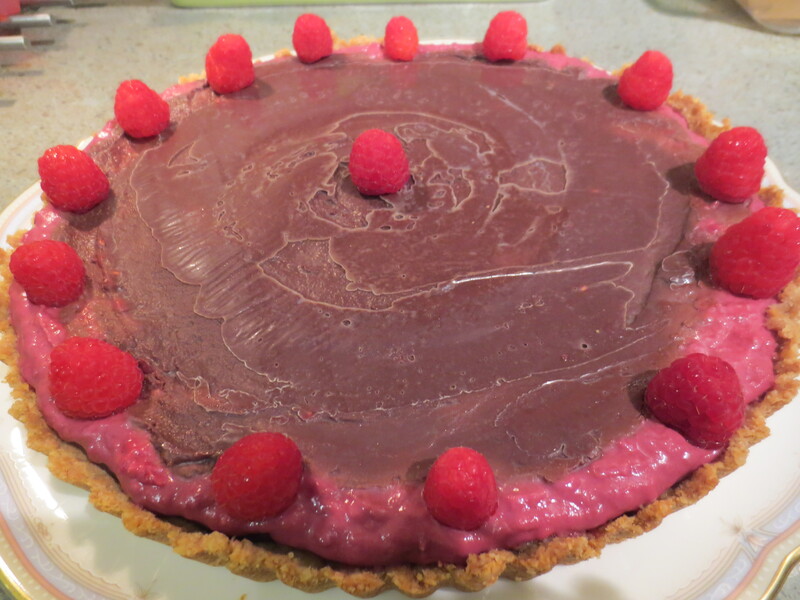 So, when I was planning Colin’s birthday treat, I decided to use the same recipe but transform it into a tart. 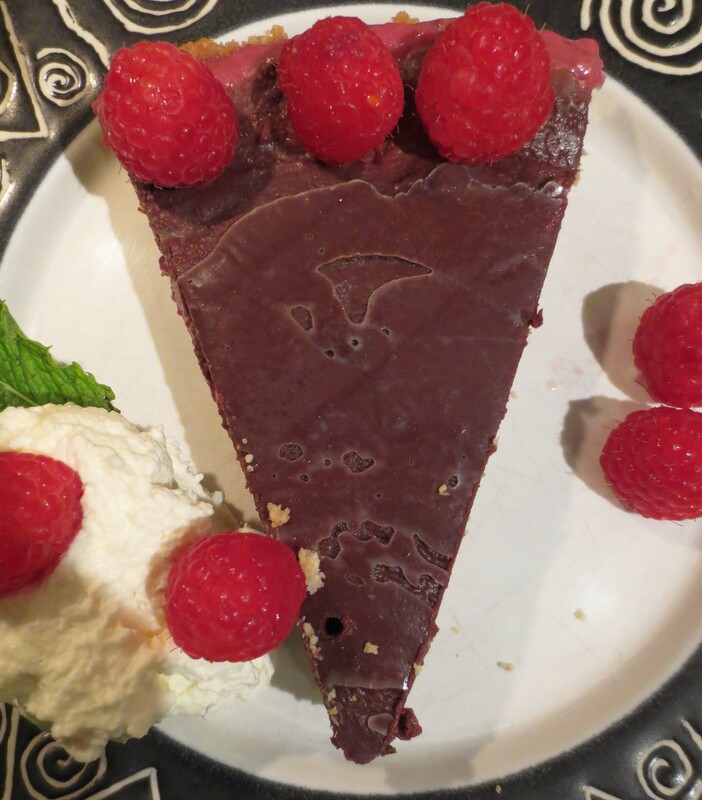 The cashew cream recipe creates more than is needed for the chocolate ganache, so I decided to mix up some of the extra cream with frozen raspberries and a little raspberry jam to sandwich between two layers of the ganache, the result was good enough to share and then some. For the crust, I toyed between a few different ideas; graham cracker, chocolate cookie crumb, etc but ultimately decided to make a wheat and butter free crust just to keep with the theme (adapted from Suburban Girl Gone Country’s almond oat crust). I used ground oats which I’m happy to eat in most anything and ground almonds which I think go particularly well with raspberries. I added a little maple syrup for sweetness and moisture, plus coconut oil. The crust looks beautiful and elegant and has a nice slightly crumbly texture. There is a subtle flavor of coconut, as Skyler (hater of all things coconut) immediately pointed out. So if you’re also not a fan, I think any flavorless oil would be okay to sub, or butter if you don’t need to keep it dairy free. The end result of this beautiful tart is not only perfect for the chocolate lover in your life (especially if that person is you! ), good enough to serve to company or for any special occasion, but you can also feel good knowing you’re eating a treat that won’t send you into cardiac arrest. It might even be a little bit good for you too, the cashew cream provides healthy fats, protein and fiber, dark chocolate is high in antioxidants, oats and almonds are heart healthy and even the coconut oil is good for you! So go on and indulge and feel free to keep the healthy secrets to yourself, no one needs to know the decadent dessert you’re serving is actually good for them. In a medium bowl combine, Almond Meal, ½ cup of the Oat Flour and salt. Next add in Coconut Oil, Maple Syrup and Vanilla. Mix completely with a fork, then add in the remaining half cup of Oat Flour and the water. 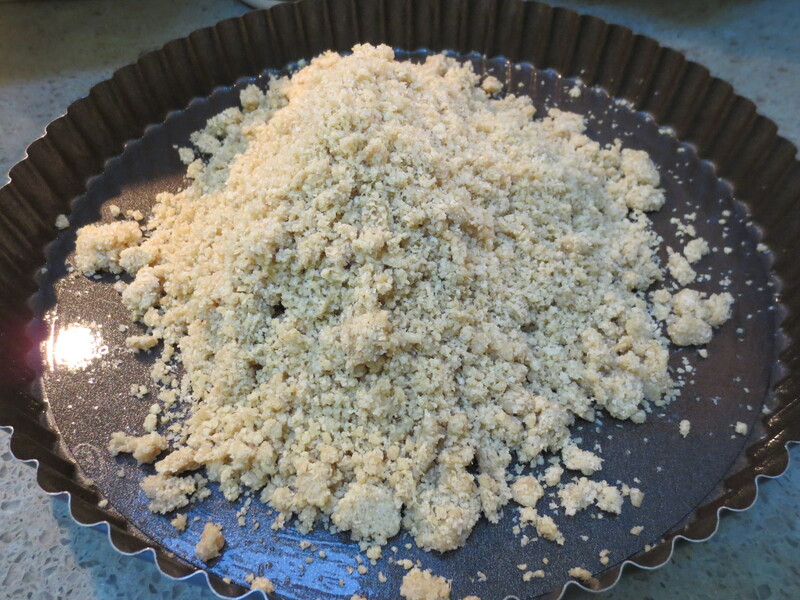 Continue to mix with a fork until the mixture resembles wet sand. Lightly coat a tart shell (I use a 10 inch one with a removable bottom) with a little extra coconut oil and then pour in the crust mixture. With clean hands (you could also use a piece of wax paper or parchment), press the crust into the shell, pushing up the sides until it is even all around the sides and bottom. Bake in preheated oven for 15 minutes. Note: if you wish to use the crust for a tart with a baked filling, only bake the tart for 8-10 minutes before filling and baking again. Either way, allow the tart shell to completely cool before filling. Soak 1 cup Raw Unsalted Cashews in 1 cup water for at least two hours or overnight. 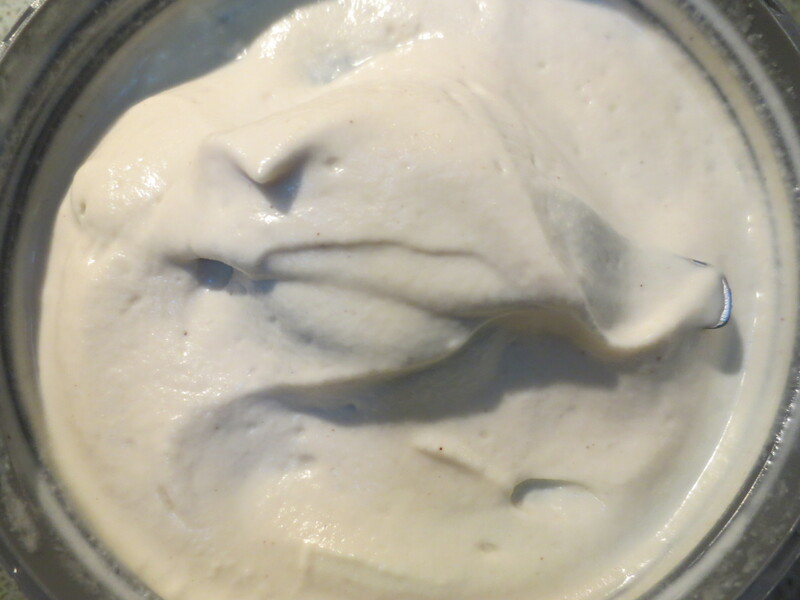 In a high powered blender, blend soaked Cashews and Water about 1 minute until creamy. In a bowl over a small pot with slightly simmering water, add Chocolate and 2/3 cup of the Cashew Cream, stir occasionally until the chocolate is completely melted and combined with the cashew cream. Once the chocolate is melted and thoroughly mixed with the cream, remove from the heat and add in Vanilla and Maple Syrup. Allow to cool. In a medium saucepan over low to medium heat, add in Raspberries, Jam and 1/3 cup Cashew Cream. 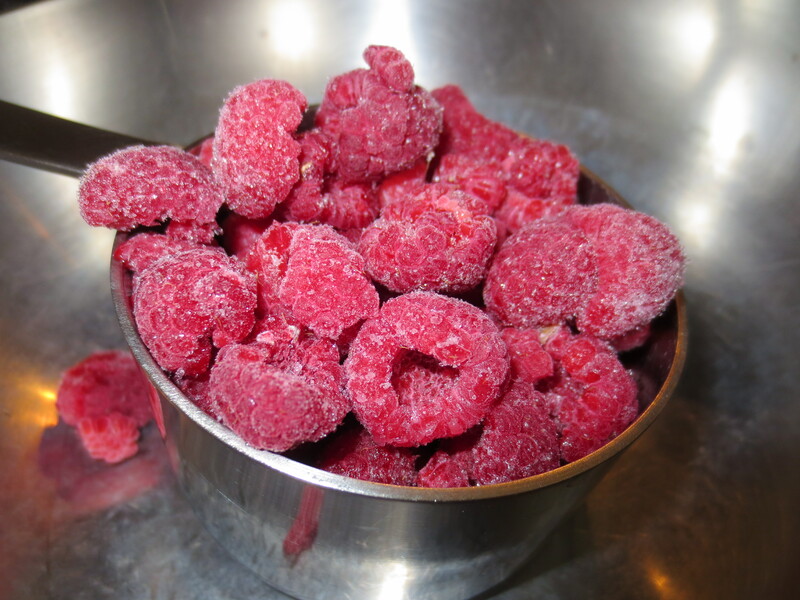 Stir and gently press the raspberries to break them up until everything is melted together. If you don’t like the texture of the raspberry seeds (which I don’t mind at all), strain cooled raspberry cream through a small strainer, otherwise use the cream as is. 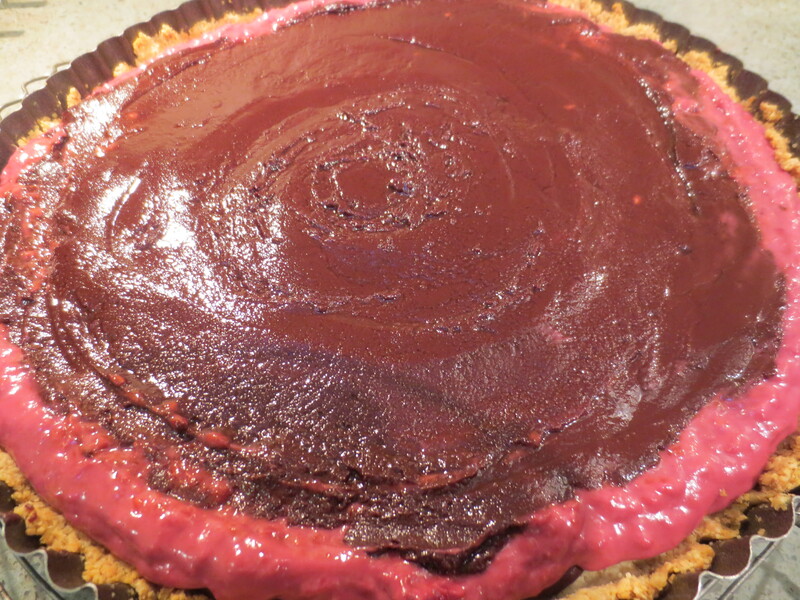 Pour about half of the cooled chocolate ganache into the cooled tart crust. 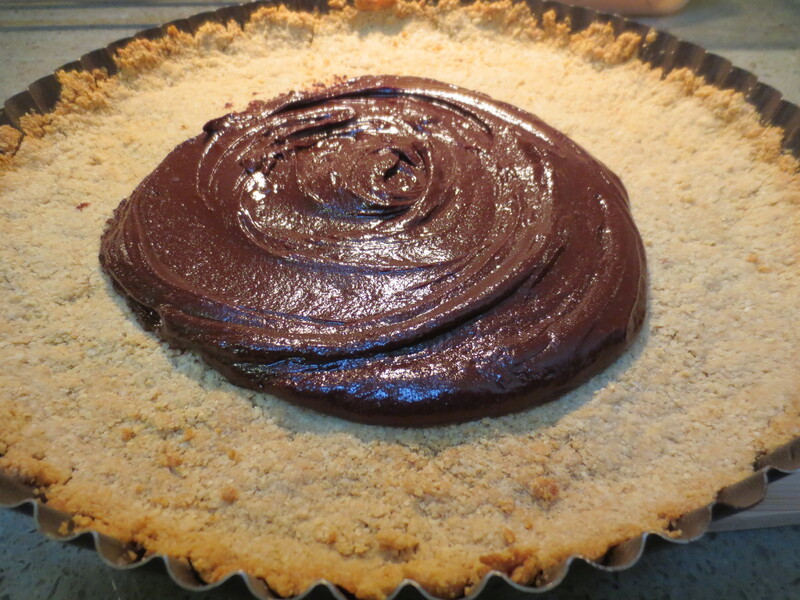 Carefully spread the ganache to completely cover the crust. Chill for about 15 minutes in the fridge. After 15 minutes, spread all of the raspberry cream over the ganache. Place in the fridge to chill again. After another 15 minutes, spread the remaining chocolate ganache over the chilled tart. 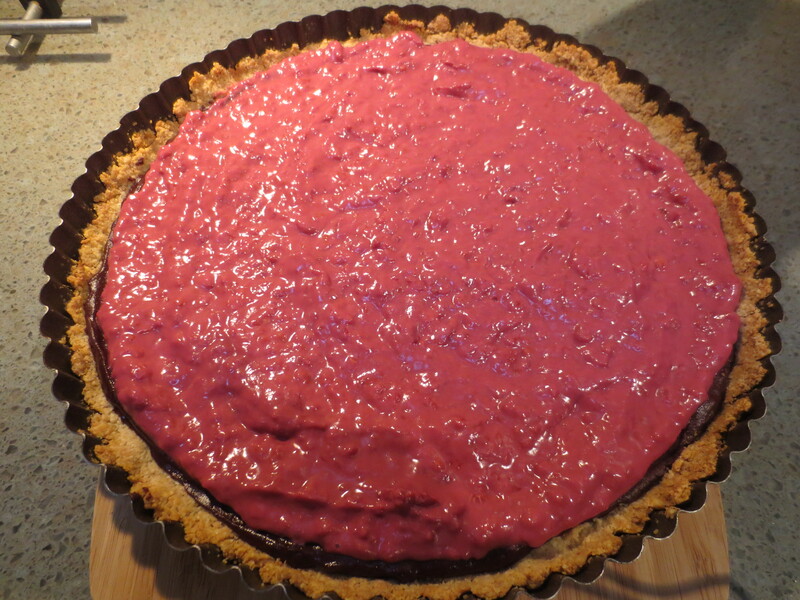 I leave about ½ inch of the raspberry cream around the edges exposed without covering in ganache. Chill again in the refrigerator, this time for at least an hour to allow the ganache to fully firm up. 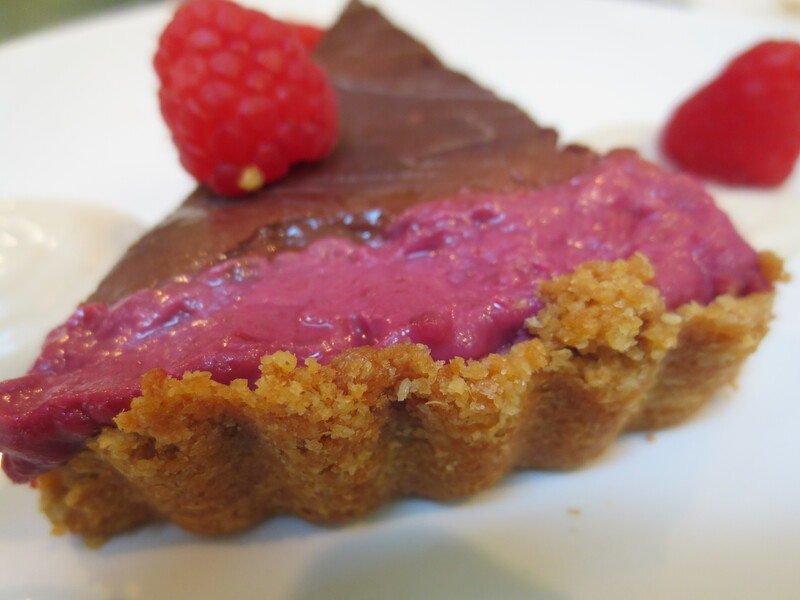 Serve the tart with fresh raspberries and cream. If you don’t need to keep your dessert vegan or dairy free, lightly sweetened fresh whipped cream is a perfect accompaniment. Otherwise, whip up the remaining cashew cream (you should still have about 1/3 to ½ cup left) with a bit of maple syrup and serve that alongside the finished tart OR double the raspberry cashew cream recipe and use the leftover as a topping. Raspberry sorbet would also be really good. If you don’t have almond or oat flour, each can easily be made using whole or slivered almonds or whole oats ground in a high powered blender or food processor. I also like using organic baby oatmeal cereal in place of oat flour. 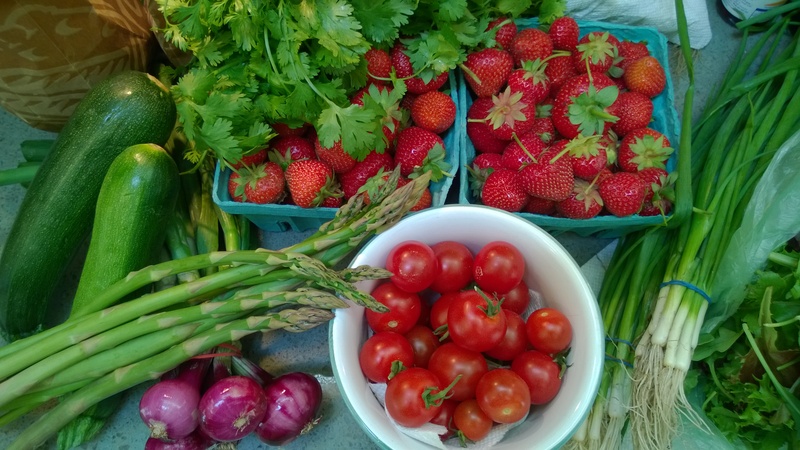 I love this time of year, when our local farmers markets are in full bloom. I find the offerings of fresh and beautiful veggies so inspiring, I often get carried away and buy way too much! Leaving with my bags loaded with more than we can usually eat in the week, happily planning meals in my head as I drive home. This week I brought home spring onions with long green tops, more than a foot in length from Taliaferro Farms, shitake mushrooms from Madura Farms and herbed goat cheese from Acorn Hill, plus gorgeous eggs in shades of browns and blue from Wrights Farm which even inspired my five year old Evan to try “oval eggs” (hard boiled) for the first time ever! 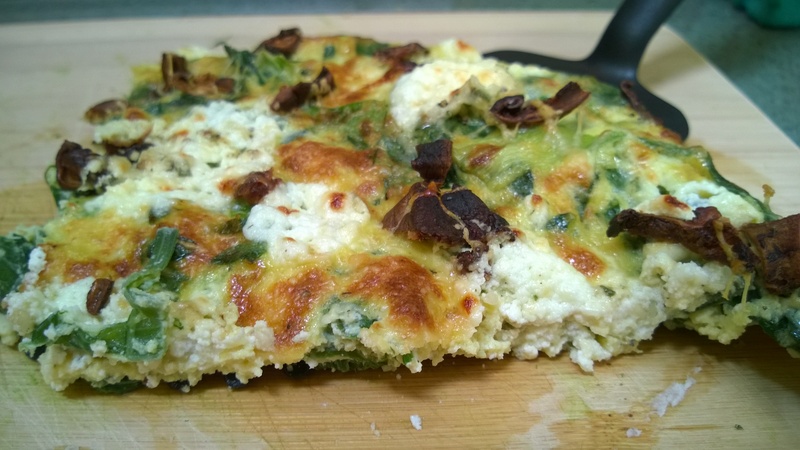 I cooked up this delicious and quick version of frittata, starting on the stove top and then finishing it under the broiler to get a nice golden brown top. I used the spring onion tops, which I think are even more flavorful than the onions themselves and cook up quicker too. 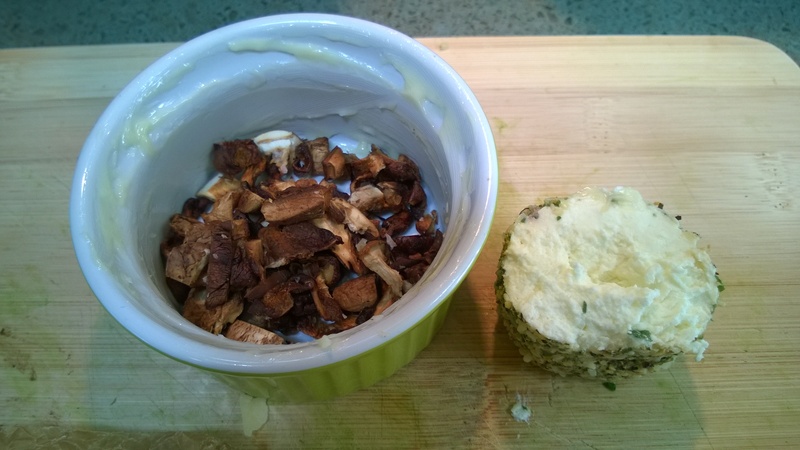 I sprinkled bits of herbed goat cheese along with crisp cooked shitakes, all over the top just before placing under the broiler, but any goat cheese you like; flavored with herbs, garlic or just plain, would be delicious here. If you can’t find young onions with the greens attached, scallions or leeks would work just as well. In fact frittatas are so versatile you could really add most any combination of veges and cheese you like and come out with great results! Serves about 4 as a light main dish with a salad or other veggies on the side, also perfect for brunch with a warm crusty roll. Heat a large non stick (oven safe) skillet (either a 10 or 12 inch pan will work) over a medium flame. Wash, dry and slice the Shitake mushrooms. Melt a bit of butter (about a teaspoon or two) into the skillet and then add in the mushrooms. Sauté the mushrooms for several minutes until they get nice and crispy. Once they’re crispy, sprinkle a little flaked salt and stir around and then remove from the pan. 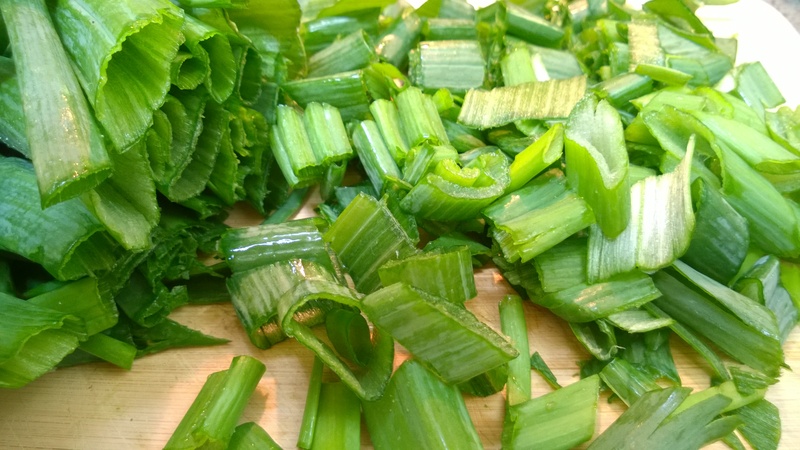 While the mushrooms are cooking, clean and slice the green onion tops. Into the same pan you’ve just removed the mushrooms from, add a little swirl of olive oil and then the onion greens. Season with a little salt and pepper. Sauté until softened and beginning to brown just a bit. While the onion greens are cooking, whisk together the eggs in a medium bowl. 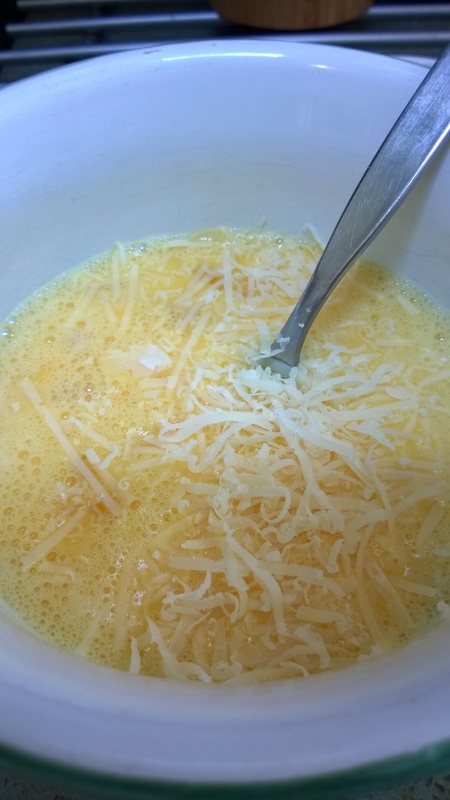 Season with salt and pepper and add about 2 tablespoons of the grated Asiago cheese. 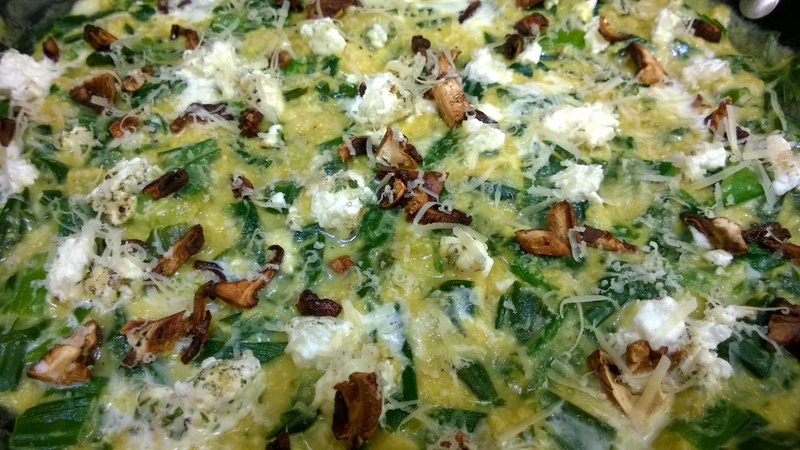 Once the greens are cooked, spread them flat over the inside of the pan so they cover the entire surface, sprinkle with about a tablespoon of grated Asiago, then pour in the eggs and immediately lower the temperature to the lowest setting. Do not stir. Once the eggs just begin to set a bit, gently stir them around the pan. 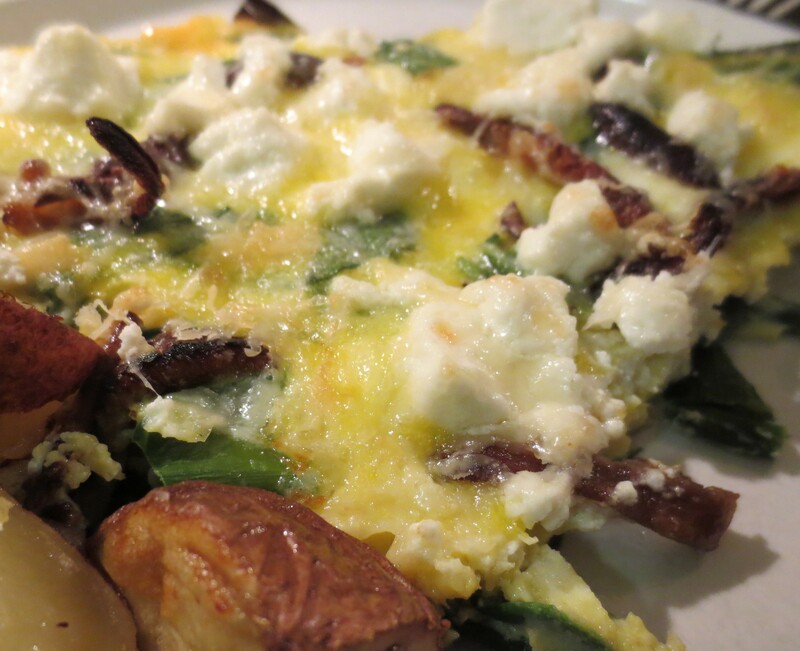 Drop the goat cheese all over the eggs in small bits and then top with the crispy mushrooms and any remaining Asiago. Remove the pan from the flame and place it in the oven about 4 – 6 inches from the broiler, turn on the broiler, watch carefully and allow to broil about 1 – 2 minutes until the top of the frittata sets and the cheese begins to brown. Remove from the oven, cut into 4-6 portions, serve and Enjoy! My name is Jen and I never met a recipe I didn’t want to change. I view recipes as inspirational guidelines, not rules to follow. I hope you find some delicious healthy recipes that inspire you to cook and eat and feel free to change at will. If you enjoy what you see, please feel free to subscribe, you’ll receive recipes as my life and time permits and I promise not to fill your inbox or your tummies with any junk. Enjoy! To receive free recipe posts by email please enter your email in the box below and click Follow. Enter your email address to follow sweetgreenkitchen.com and receive delicious recipe posts by email.